Mazda is claiming that its all-new Mazda3 has improved economy and performance and will bring drivers ‘uncompromised’ fun. I’m not entirely sure what ‘uncompromised fun’ is behind the wheel of a car but there’s no doubt that the Mazda3 is a serious contender for people thinking of buying a VW Golf or a Ford Focus. There are 36 models in the Mazda3 line-up, it’s the third generation of the model, and there are 21 hatchback and 15 fastback versions. Prices start from £16,695 to £23,345 on-the-road. There’s a choice of three SKYACTIV-G petrol engines: the 1.5-litre 100ps, 2.0-litre 120ps and 2.0-litre 165ps to choose from as well as a 2.2-litre 150ps SKYACTIV-D turbo diesel engine. Mazda is very pleased with its engine technology which should deliver up to 72.4 mpg on the combined cycle and which have low CO2 emissions of just 104g/km. The new Mazda3 goes on sale from January and there are five spec levels and they all have lots of standard equipment including air con, alloy wheels, colour touchscreen, and the now standard USB/iPod connectivity and Bluetooth. There’s also a new social media and Internet integration system called ‘Aha’ which delivers free Web-based infotainment, such as Internet radio. Mazda say that there are future proofing the Mazda3 by incorporating things like text messaging and navigation technology for the vehcile’s occupants – though the driver will have to provide their own data provider. The exterior for the new Mazda3 has been radically altered but now looks similar to the impressive Mazda6 and the Mazda CX-5. 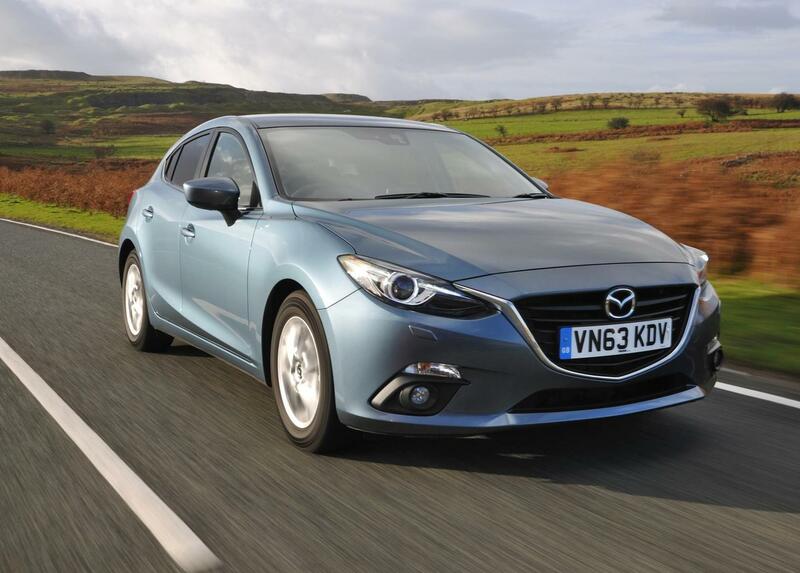 Fans of the Mazda3 will also find it has a lower stance and a stiffer bodyshell to help resist impacts. The new design also provides for a stable platform which makes for an improved driving experience along with improved suspension, brakes and steering. More importantly, the all-new Mazda3 will be one of the safest cars on the UK’s roads after picking up a 5-Star safety rating in the latest Euro NCAP tests and underlines the carmaker’s dedication to building safer and stronger cars. Available to order now, the Mazda3 comes in nine colours and with the technology and standard equipment, the carmaker has created a vehicle that should attract a lot of attention particularly for people want an efficient engine that will be cheap to run. This entry was posted in Car Leasing, Cars, Family Car, New Cars and tagged lease a new Mazda3, mazda, Mazda3 by Steve Lumley. Bookmark the permalink.